Saguaro National Park, east of Tucson AZ, March 1973. There had been an unusual rainy spell in the desert. 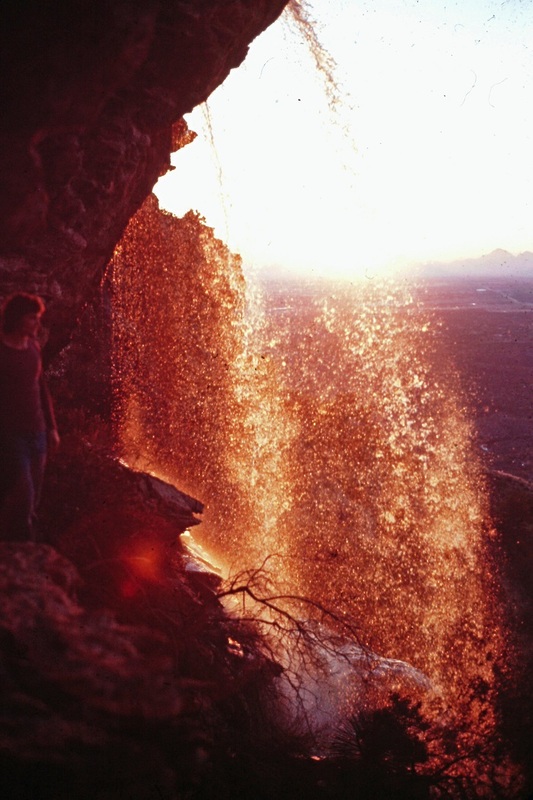 My friend and I scrambled up several hundred feet of steep rock in time to witness sunset through a curtain of falling water from behind this waterfall that is usually dry. There is something very special about a waterfall that you can walk behind. You're cut off from the rest of the world by a moving wall of water. The gush of the cascade echoes off the rock behind you, enveloping you in sound. It's not easy for me to explain why, but waterfalls have always been my favorite single geological phenomenon. 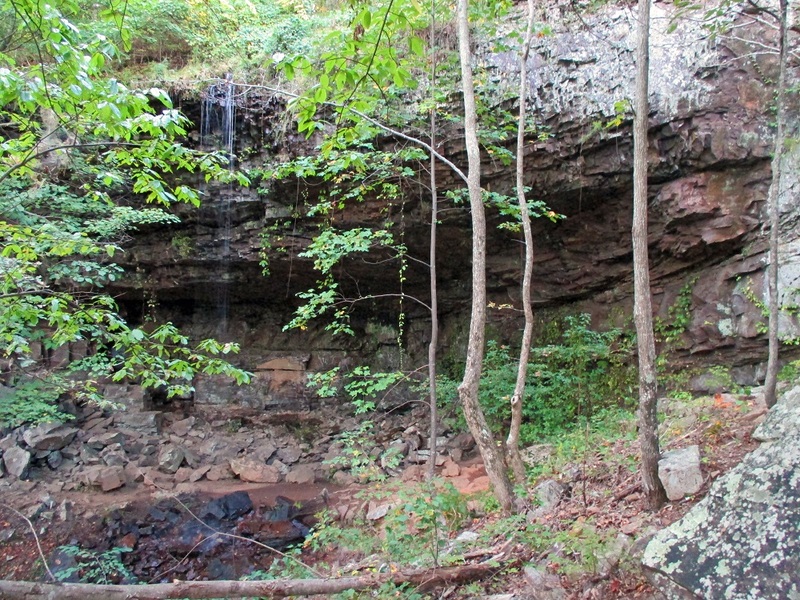 So a waterfall that has a trail behind it is, for me, the ultimate destination. Keown Falls, on the Pinhoti Trail, is such a place. Sadly the trail that goes behind that cascade is not the Pinhoti but the Keown Falls loop trail. They ought to consider rerouting! Anyhow, I've only hiked behind a waterfall on a formal trail in one other place--Kapaloa Falls via the Kohala Ditch Trail on Hawaii's Big Island--and that trail has since been destroyed by an earthquake. 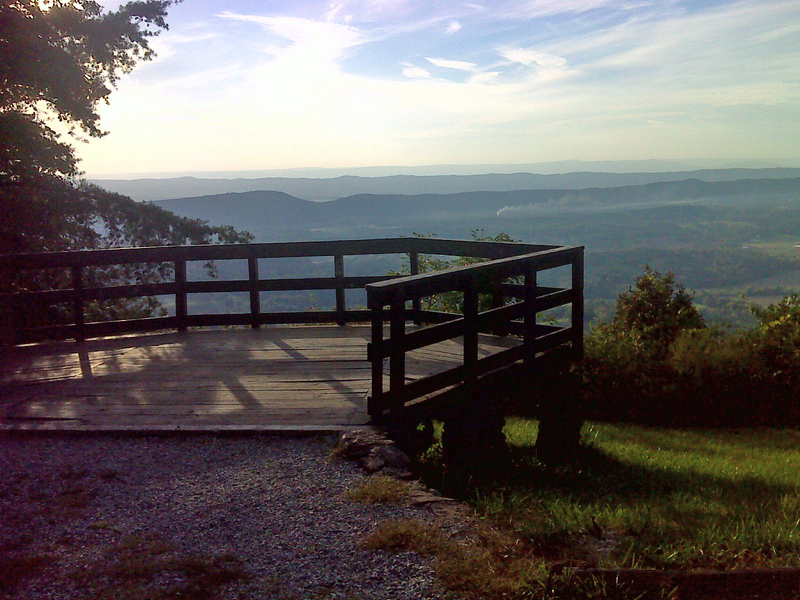 So, as far as my resume now goes, Keown Falls is the one-and-only. It doesn't have the volume of that waterfall shown above--it's really just a trickle by comparison, but the cavernous space behind it has room not just for a trail, but room to live--to set up camp or even build a shelter. In my novel series, Eden's Womb, I have the main characters spend their honeymoon in a little cave dwelling behind a waterfall because that's where I wish I could. I've always loved the artificial waterfall grottoes at water parks and hotels. You get the idea. 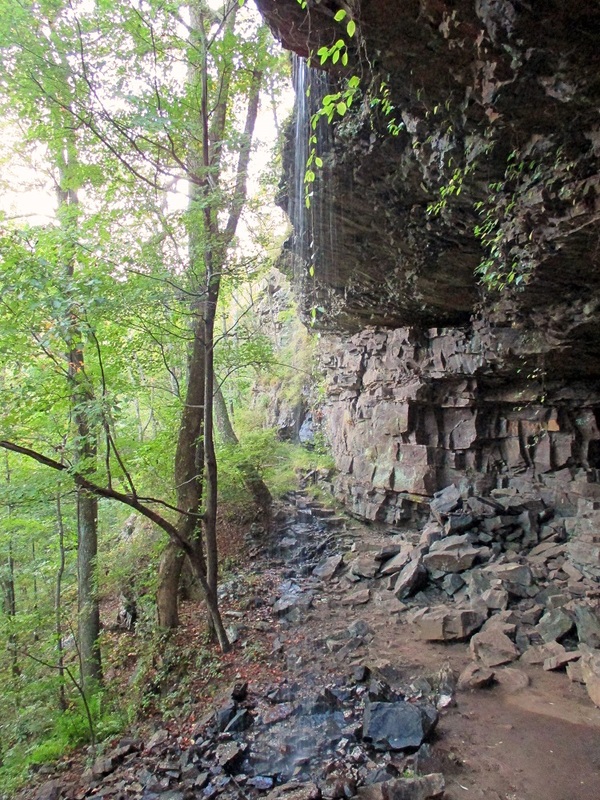 Okay, so here are three views of Keown Falls - face on, from the side (looking along the trail), and looking up. I reached the falls in the evening after a fifteen mile day, and the light was fading. It faces east so would be best experienced in the morning. Perhaps I'll go back. Other special sights today included an abundance of sunflowers at man-made Pilcher's Pond (two views) and a man-made clearing on top of John's Mountain. The simple things are not man-made, like thistle down and snail shells. This area must be snail Mecca, because I've never seen so many of their shells in one hike--I saw hundreds. But when the natural sights and sounds don't stimulate me enough, I do tend to consider making things happen. Today I decided to decorate my shirt. And that started a dangerous trend. Be forewarned: I'm travelling with lots of clean shirts--like to do laundry in big batches and seldom. I also have a collection of seventeen hats and a growing collection of new and old Crocs--the 'shoes' I now do all my hiking in. I rotate through these hats and shirts, and will now rotate through the Crocs too. 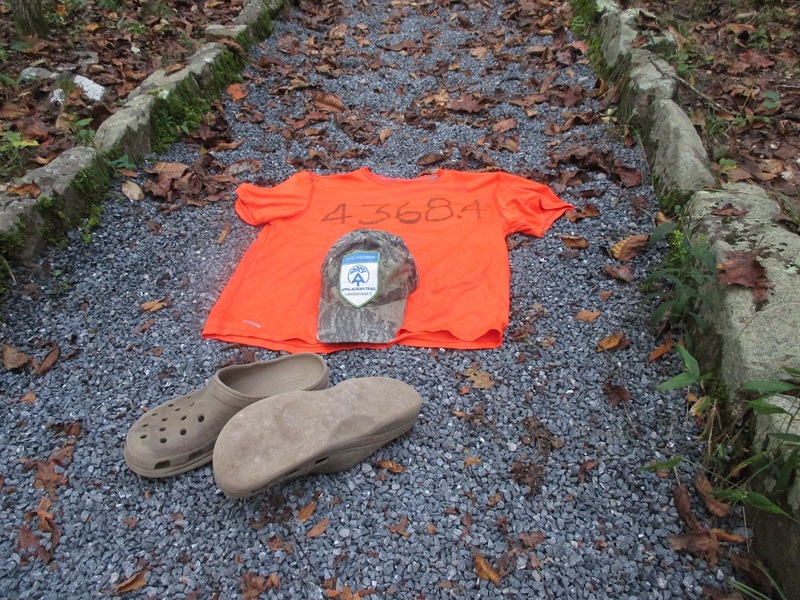 Here are today's hat and Crocs, which I've labeled as number two because my I started yesterday's hike with all clean laundry and thus wore shirt number one yesterday. Shirt number one happened to be the shirt I decorated to celebrate the completion of my '4368.4 miles or Bust' AT double in 2012. And that got me thinking about decorating shirts. The flood gate has opened. You have been warned! 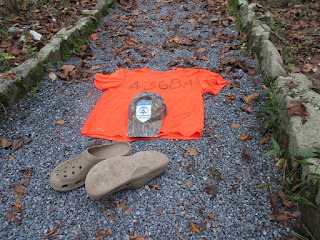 Hat, shirt and crocs number one. The cCrocs are the very first pair I ever bought - back in 2007 when I was buying gear for South America mountain climbing. Still very comfortable and functional but the tread has worn completely away. Photo is taken on the trail to Keown Falls - somebody spent a very long time hand-setting these stones in perfect straight lines and laying down the pea-gravel.